History of how it all began. To those of you who have been following our web site, we have enjoyed your comments and seeing all of you at the races. One the most common question that is asked of us is " How long have you been doing this?" or " How did you get started?". So I / we have put together a little history of how Rice/Vigeant Racing came to be. For some of you this will walk down memory lane. My very first recollection of the Rice's was my seventh grade science class. One of them, (Alan) was the teachers assistant. The reason the memory stands out is that during one of the teacher's lecture, there came this small explosion from the back room. Needless to say, the teacher was not too thrilled. The next time I ran into them was when I joined Boy Scout troop 538. This is where Alan, James, and I really first met and became life long friends. The Boy Scouts is also where we met many of our friends. For those of you who get the newsletter version there are a few troop 538 alumni on that list. For those of you who don't know Alan and James work all the way to the top and earned their Eagle Scout . The three of us all came from car families. The Rice's though, were not racecars. They had more and every type Volkswagens than anyone that I knew. 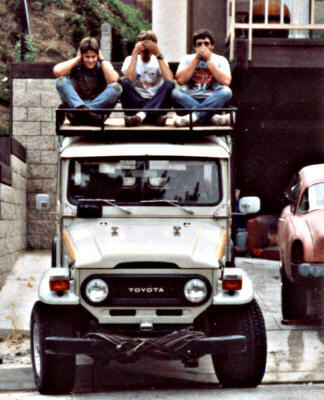 (Ed note: It wasn't that many, just a Bug, a Super Beetle, two Squarebacks, a Thing, a Fastback, and a Baja bug, but never more than 3 at one time). Alan and James's parents being a school teachers with four kids took on an extra job. The job was an auto paper route, which the V.W. "Thing" work great. Following in his father's foot steps Alan also had an auto route, all though his vehicle of choice was a surplus postal jeep. For those who know Alan and James away from racing, they have a love for the outdoors and their vehicles started to parallel that. Alan while in the Navy bought himself a V.W. Baja bug. It worked out great for running around the deserts of southern California. James also went for the all terrain vehicle. After going through a wimpy VW and a mini-truck he got a Toyota Land Cruiser. It was slow and used every bit of fuel he put into it, but it would go anywhere. After the stock straight six died, he scrapped enough parts together to install a good'ol American V-8 Chevy. We're just not sure what we created, it was ether a Chev-ota or a Toy-leta? Myself (Mark), came from more traditional hot rod family. 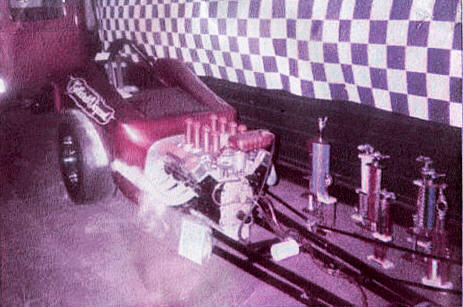 Back in the 60's on the east coast, my dad and his partner drag-raced stockers, then stepped up to an A gas dragster. The car ran a Ford FE 427 with ALGON fuel injection, and with the fiberglass body installed, they could run Comp-Coupe. After moving to California, kids, and the hassle of packing up the family to go desert motorcycling, my dad settled into the street rod scene. That's where I found my love for cars. 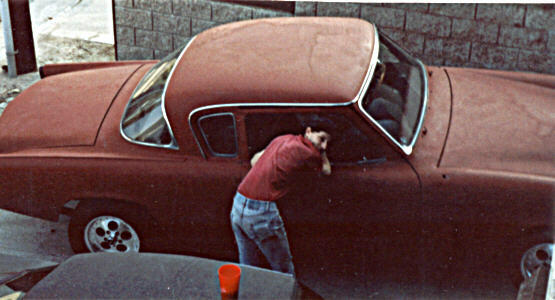 My dad was going to teach me right, he gave me my first car, a '31 Ford five window coupe. There was some assemble required, ( a trailer load and many boxes). Nine months later, I was driving my first street rod. In the 80's, in the time of hopped up VW's and lowered mini-trucks, the "School Boy" coupe stood out in my high school parking lot. Unfortunately, the rear axle broke, resulting in violent crash, and that was the end of the coupe. I then found a 1960 StudeBaker Hawk. The fins had been removed, and I added the front nose from a '53. That's when I started to look at Land Speed racing.